As Samsung’s impressive Galaxy S9 and Galaxy S9 Plus hit the market in 2018, some iPhone users may see a good opportunity to switch from iOS to Android, which makes how to transfer contacts, as well as other private data, from iPhone to Android become a hot topic on the Internet. Is it possible to switch from iPhone to Android without losing contacts? Of course yes. This passage will share some simple solutions to transfer iPhone contacts to Android with you. 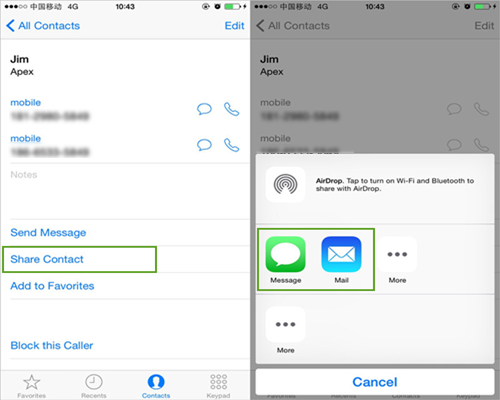 iPhone offers a built-in Share Contact option to transfer your contacts to another device. But it is recommended only when you just transfer a small number of contacts from iPhone to Android, because you have to transfer one by one, and this requires a huge amount of manual work. Go to the Contacts app on your iPhone and choose the contact you would like to transfer. Slide down and click the “Share Contact” button. Then export this contact from iPhone to Android via message or email. If you have a number of contacts to transfer, using a third-party phone transfer tool is the best choice for you. 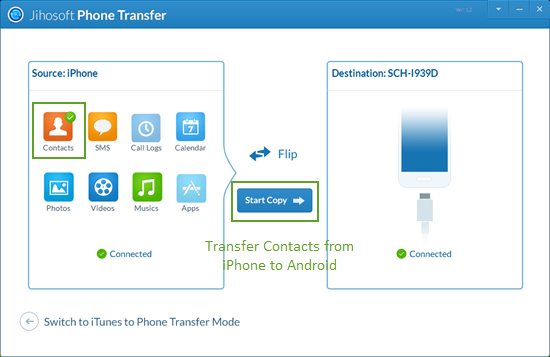 Jihosoft Phone Transfer is one such tool, which can transfer all of your iPhone contacts to Android by one click. Besides, it also allows you to transfer photos and videos from iPhone to Android, and more file types like text messages, call logs, calendar are also supported. Install and launch Jihosoft Phone Transfer on your computer. Connect both your iPhone and Android phone to computer via USB cables. Set your Android phone as “Destination” and iPhone as “Source”. Mark the “Contacts” in source panel and click “Start Copy” to send your iPhone contacts to Android. iPhone: iPhone X, iPhone 8, iPhone 7, iPhone 7 Plus, iPhone SE, iPhone 6S, iPhone 6S Plus, iPhone 6, iPhone 6 Plus, iPhone 5S, iPhone 5C, iPhone 5, etc. Android: Samsung Galaxy S9/S8/S7/S6/S5, Huawei P20/P10/Mate 10, HTC U11/One X10/One S9, Sony Xperia XZ1/Z5/Z4/Z3/Z2, Motorola Moto G/X/E, LG G6/5/4/3/3 Stylus, etc. Actually, iCloud can not directly move your contacts from iPhone to Android, but it allows you to export your iPhone contacts to computer and then you can import them to your Android phone. Enable iCloud on your iPhone and sync your contacts. Open the web browser on your computer and login to iCloud.com with your Apple ID and password. Tap on Contacts, and select the contacts you want one by one or via the “Select All” option. Hit the gear and choose “Export vCard”. 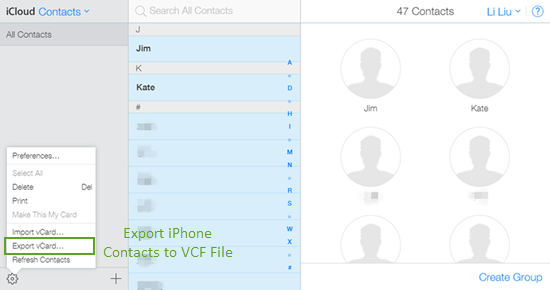 Then the selected iPhone contacts will be exported to computer as a VCF file. Use a USB cable to connect your Android phone to computer, and import the VCF file to it. Finally, move the contacts from iPhone to Android through the default Contact app. Syncing iPhone contacts with Google through iTunes is another useful method to copy contacts from iPhone to Android if you are using an iPhone with iOS 4.0 or lower. Open iTunes and plug your iPhone to computer with USB cable. Head to the summary page and click “Info” option. 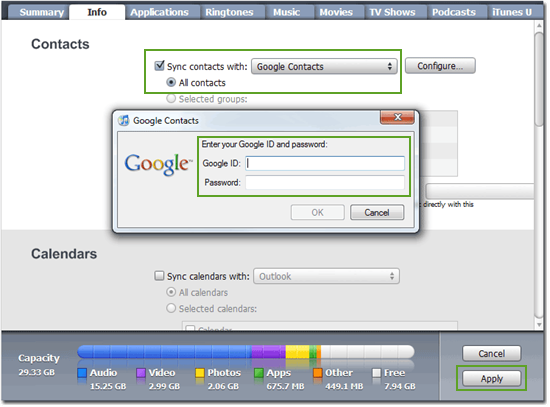 Then check “Sync Contacts with” and choose “Google Contacts”. Enter your Google username and password in the pop-up window and click “OK”. Once it is done, go to Menu > Settings > Accounts on your Android phone, tap on “Add Account” and choose “Google”. Sign in with the same Gmail account. Wait for a while, tick “Sync Contacts” and tap on “Finish”.